(Newser) – An ISIS-affiliated group of hackers released a "kill list" that includes the names, addresses, and phone numbers of at least three dozen Minnesota police officers, KMSP reports. The list was found on the encrypted messaging app Telegram by web analysts at Vocativ on Monday. It was created by a group called the Caliphate Cyber Army and includes the message "wanted to be killed" along with information about the officers, according to the Minneapolis Star Tribune. The FBI is taking the list "very seriously" and is working with local agencies to track down the hackers. "Clearly, in law enforcement we don’t want this information out there at all," an FBI spokesperson tells KMSP. I'm wondering why we(U,S. )are NOT boycotting\shutting down these company's who are 'supplying' Terrorist Groups with vehicles and ALL the implements of war?....smh...WTF?? Whoever evil POS decides to go after these cops will find not an easy victim; but one who will more likely kill them instead. These evil POS are good at killing defenseless people; but run when confronted with people armed to defend themselves. 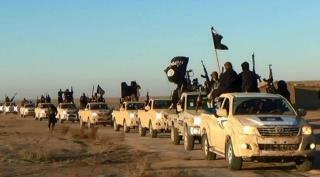 Has anyone gotten and answer fro Toyota where they got all those new Toyota P/u?